Aliases: Gorm, Managarm, "Best of Hounds"
Powers/Abilities: Garm has the appearance of a large wolf, and possesses powerful jaws and claws. He is ferocious in battle, but is able to speak the tongue of humans. History: (Norse/German Myth/Thor Annual#5)- Garm is an immense wolf who is chained to guard at Gnipahellir, the entrance to Hel, land of his mistress Hela. He is covered with blood, but will allow anyone living to pass him by; only the dead are prevented from leaving, and will be torn to pieces should they try to escape. At the time of Ragnarok, it is prophecized that Garm's chain will shatter, and he will devour Tyr, but die himself in battle. (Raven Banner GN) - Greyval Grimson, during his quest for the Raven Banner, took a trip to Hel. He passed by Garm. (Thor I#339 (fb))- During Balder's descent into Hel, he passed by Garm at Hel's entrance. (Thor I#361)- Garm confronted Thor and the Einherjar as they began their journey into Hel, and gladly welcomed them to Hel's embrace. He boasted that he had been called the doom of Tyr, and would perhaps one day be the doom of Thor as well. (Thor I#362)- When Thor led the Einherjar from Hel with mortal souls they had taken from Hela, Garm attempted to prevent his crossing, but Thor brought him down with a furious assault using Mjolnir which knocked him unconscious. Thor would have slain Garm there, but "in the spinning of the world's tale, he has some part yet to play." (Thor I#382)- After Thor took possession of the Destroyer, he came to Hel and confronted Garm. Garm threatened to slay him, but Thor brought him down with a single blast from the Destroyer armor. (New Mutants I#82)- After the New Mutants were taken captive by the Valkyries, they were led to Hel and past Garm. Wolfsbane became upset at the sight of Garm, seeing in him the evil she feared existed in herself. (Thor I#438/2)- After Hela attempted to revive the Destroyer under her control, the Destroyer was possessed by Lorelei and turned on her and Garm, and Garm was concealed within rock, only his head left exposed. He related what had happened to Balder and Sif, and they were ultimately able to save Hela and incapacitate the Destroyer within Midhogg. (Thor I#476)- Garm observed as Hela drove Lorelei's spirit from the Destroyer so that she could employ it against Thor. She had Garm take possession of the armor along with the Donald Blake duplicate, and sent him to Earth to battle Thor. In the course of battle, Garm managed to shatter part of Mjolnir using the Destroyer's strength. (Thor I#477)- Before Garm could disintegrate Thor, he was attacked by Thunderstrike, and at Hela's command, fled the scene with Mjolnir in his grasp. Thunderstrike and Thor found Garm again by searching him out from the Empire State Building and joined their power against him, but seemed unable to win. However, Thor guessed that the Blake duplicate was part of the force animating the Destroyer with Garm, and the Blake duplicate managed to shatter Garm's hold over the Destroyer long enough for the two heroes to bring the Destroyer down, removing Garm and the Blake duplicate's spirits from the armor. (Thor I#486)- When Kurse was duped by Malekith into entering Hel, Malekith disguised himself as Hela and commanded Garm to attack him. Kurse easily flung Garm through the air. (Thor I#488 (fb))- As Kurse lead an army of the dead from Hel to Earth, Sif journeyed to Hel where she found Garm. Garm came to realize that he had been tricked, and with his help, Sif soon found the real Hela and brought her attention to Kurse's army. (Thor I#489)- After Thor turned himself over to Hela to save the Earth from the creatures released from Hel, Balder and the Hulk invaded Hel to save him. Balder squared off against Garm while the Hulk went on. When the Hulk finally returned with Thor, they found Balder still battling the giant wolf. The two heroes then simultaneously struck Garm down and departed Hel. 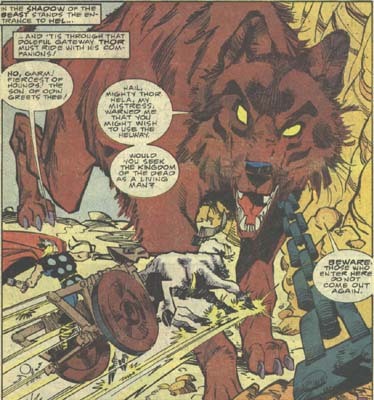 (Marvel Double Shot#2/2)- Garm assisted Loki in playing pranks upon the Avengers by allowing him to make use of some of his doggie-doo, which Loki placed in a flaming bag on the Avengers' doorstep. Captain America ruined his new boots stamping out the fire. Comments: Adapted by Steve Englehart, John Buscema and Tony Dezuniga. Will U: In the myths, the Fenris Wolf is almost definitely equated with Garm. Both creatures were shackled at the gates of the underworld; both creatures were at one time or another subdued by Tyr (who is called Haakun in the German story) and both creatures are killed by Tyr at Ragnarok. The book, �Norse Mythology A-Z� by Kathleen Daly, even goes on to mention that Garm is sometimes thought to be another name of Fenris. In the Marvel Universe, however, they are separate creatures. Garm devouring Tyr at Ragnarok is depicted in a nightmare of Thor's in Thor I#472. Even a cursory glance of Garm's adventures will reveal his less-than-stellar performance as watchdog of Hel. No wonder Hela made use of Cerberus once! The info for the Raven Banner GN was provided by Per Degaton. Garm supposedly died during the Ragnarok in Thor II#85.